The popular expression "Our answer to Chamberlain" a little less than a hundred years. This is an amazing example of how striking statements of the most important areas of life intrude into everyday language and become idiomatic. As "Our answer to Chamberlain" was coined recently, it is possible to trace the history of this amazing phenomenon, now already become philological. It all began in 1927, when the foreign Minister of Britain, Joseph Austen Chamberlain was sent to the Soviet government a note to stop supporting revolutionary movements in China and spread out anti-British propaganda. This event was widely covered in the Newspapers. Particularly important was the publication in the newspaper "Pravda", which set the tone for media across the country. The first article was called "Our answer to the British note", it was published on 27 February 1927. March 2 in the "Truth" is another article on the same problem, and it already bears a proud name "will Take to Canton! Here is our answer to Chamberlain!". The phrase quickly became winged, but the first time it was used when it was about the confrontation of the USSR and the rest of the "bourgeois" world. 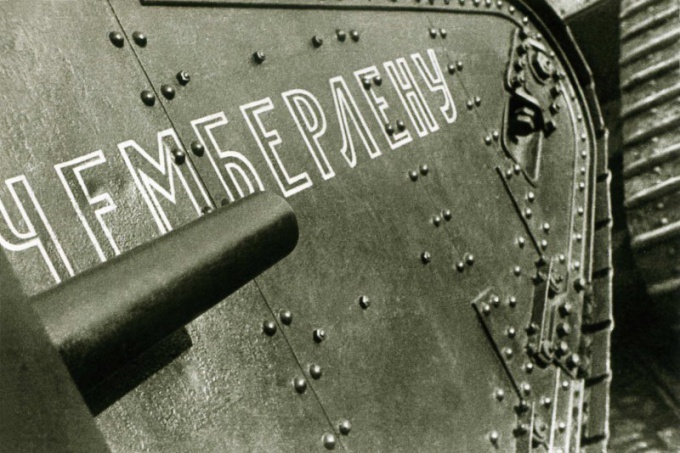 9 June of the same year, the organization Osoaviakhim organized the collection of national resources for the construction of the fleet and the defense of the country, the money went into a special Fund, which was entitled: "Our response to Chamberlain." Later the same name was given to it from the flying squadrons. Generally, in those years it was popular to emphasize by all possible means, as far as the rest of the world hostile to the Soviet Union. For example, one flight squadron wore the proud name of "Ultimatum", in honor of the Soviet response to the ultimatum, which the country supplied the British Lord Curzon. But "Our response to Chamberlain" was the undisputed leader. Big words, they came from almost any "good for business socialism" thing, the name was proudly wearing armored divisions, clubs and organizations. Later it turned out that the support of the Kuomintang movement, which is opposed by Chamberlain was not the right decision, as the Kuomintang pursued its goals, disadvantageous to the USSR. However, in 30 years the phrase "Our answer to Chamberlain" was a real national treasure. Lord Chamberlain, caricature portrayed as arrogant bourgeois in a tuxedo and monocle, contemptuously looked at the Soviet workers to the British proletariat, was believed by the people, it is exactly the same. Became the mythical image of Chamberlain was depicted on posters, matchbooks, flyers in Newspapers. The Minister in these images and then dodged the proletarians and kulaks, fico, tanks and aircraft. Joseph Austin Chamberlain hardly knew how popular he became in the Soviet Union. The former Minister died in 1937. In Russia, few people remember the names of his colleagues and predecessors, but we all know of Chamberlain, not even knowing who it is. "Our answer to Chamberlain" - this phrase, no doubt, become the property of the idiomatic stock of the Russian language. Today it is used when we want to describe a decisive rebuff, and the context can be both serious and ironic.